Happy Ostara, peeps! 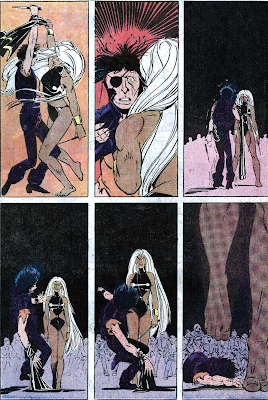 In honor of this day of blood sacrifice (Nothing like killing your own son to impress your Godhead), I thought we’d take a look at the time when Storm decided that she would relax her vow of not taking another person’s life! Not her most glamorous time, certainly, but her toughest, as here we see that all that time training with Wolverine has paid off! What’s that, Callisto? You wanna kidnap boytoy Angel ’cause he’s pretty and all you Morlock folk are notsomuch? You wanna marry him? Really? Ooohkay. Er, I mean, no thank you. We like Angel up above ground where he can fly around and loan us money and hit on Jean Grey. Oh, and Callisto? Joan Jett and Nick Fury called and they want their stuff back. And there we go. 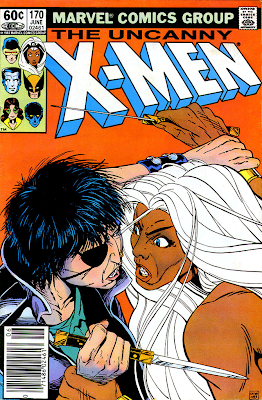 Nobody thought Storm had it in her to stab the old girl in the heart. But she did. And she got Angel back and got her team safely home. She also earned the leadership of the Morlocks which is more of a punishment than a blessing, ’cause nothing good ever came of that (except the fierce vest she wore). See ya Cal. Never liked ya anyway. Stumptown Bound! And What’s Up With These “Dark X-Men”? so i guessed that you might be on this more often than you check your e-mail, so i made a twitter simply to get ahold of you! it is the most confusing thing ive done online… i dont get it. but i only made one to chat it up with you.